Last Few Days... - Never attribute to malice that which can be adequately explained by stupidity. Over the last few days I've been doing my taxes. I hate doing these accounts and would happily swap having to do them with an hour or two in the dentists chair. I've now finished the wretched job and a dozen or so, freshly printed spreadsheets are ready to be sent to the accountant. Big sigh of relief. That's that job over for another year. So... back to restoring the house. The office floor has been coming on nicely. The threshold needs to be laid-out to match the door frame, so the new (100 year old) door needs to be hung. Only trouble is the new (100 year old) door was originally hung so it opened the opposite way. 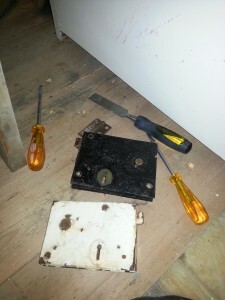 It's an easy job to reposition the hinges and a lock, the only problem was the lock on the door is a rimlock, and not the reversible type. Well I got lucky and found a right-hand version of the lock at the local Saturday market. that don't line-up or keep any of the doors shut. 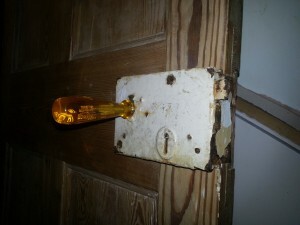 The hand carved amber door knob really sets it off. Oh hang-on that's a scewdriver. I wonder if I should strip the paint off. I've had a chap pop round to measure up for new windows. I really want to get rid of the Lego windows. The other day I asked the lodger for her opinions on windows, her reply was "Stick with 7, don't touch 8 or 8.1 with a bargepole, wait for 9." Sound advice I thought.